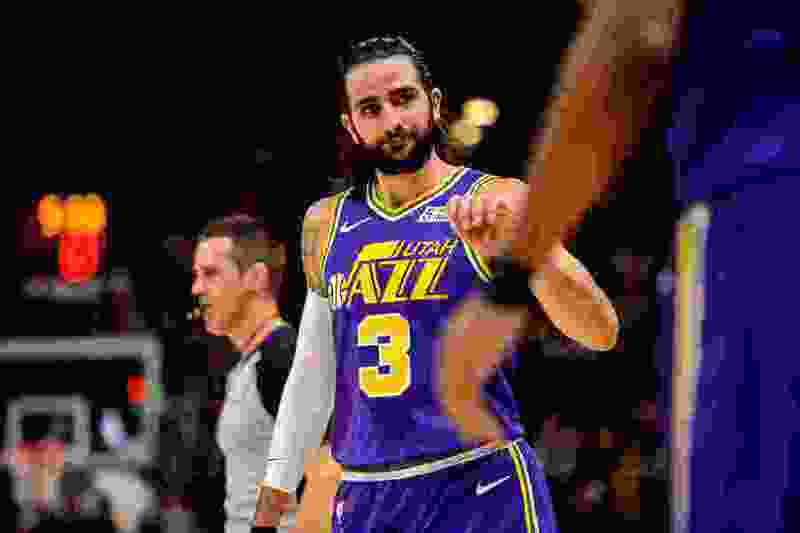 (Trent Nelson | The Salt Lake Tribune) Utah Jazz guard Ricky Rubio (3). Utah Jazz v Indiana Pacers, NBA basketball at Vivint SmartHome Arena in Salt Lake City on Monday Nov. 26, 2018. Donovan Mitchell is the Jazz’s most exciting player, their marquee player, along with Rudy Gobert. That’s why you see those two featured in Jazz TV ads, writing love letters to fans, telling them that they feel at home here, that they are connected to the people here, that they play here, score here, dunk here, block shots here, rebound here, complain about the refs here, live here, Rudy speaking French and Donovan speaking Connecticut-ese. But there’s another language that could be spoken in those commercials, a voice that may not be as loud as the others, as colorful, as commonly heard, but that is equally significant when it comes to the Jazz winning. The language is Spanish and the player who speaks it is Ricky Rubio. Cuando Rubio juega bien, El Jazz generalmente gana. Translated: When Rubio plays well, the Jazz generally win. When Rubio doesn’t play well, the Jazz generally lose. It’s not as simple as that, but it is evident, in any language. Except for the one spoken in numbers, which is why statistics sometimes have a bad reputation for lying like a schnauzer in the hot summer sun. This season, Rubio’s most basic stats break down like this: Going into Thursday night’s late match with Philly, in Jazz losses, the point guard averaged 13.4 points, 6.3 assists, 3.4 turnovers and 3.2 rebounds. In Jazz wins, he averaged 12.4 points, 6.6 assists, 3.4 turnovers and 4 boards. Apparently, those numbers, that single point in arrears and fractions of an assist and a rebound make all the difference. Anyone who has spent time actually watching Jazz games instead of juicing numbers knows when Rubio brings his A-game, the team he’s quarterbacking is much better off. The offense just flows better. When he’s active at the other end, the collective defense is much more effective. It is fair to say that in some of the defeats the Jazz have suffered, their negative margins would have been considerably wider had Rubio not played well. In the losses where he played poorly, the Jazz were absolutely blown off the floor. Last season’s numbers are less like schnauzers, more indicative of Rubio’s impact. When the Jazz turned a record that initially looked as though it would land them in the lottery (19-28), and then suddenly, all redirected, shoved them instead straight to the playoffs with a 29-6 mark, it fittingly enough started with a late January game against Detroit in which Rubio played a significant role. From that point on, the point guard averaged 16 points, 6.1 assists and 5.3 rebounds. His playoff performance, before he was injured, in a first-round victory over OKC was top-drawer. The Jazz’s win over Portland on Christmas night was emblematic of the disparity that sometimes arises between Rubio’s numbers and his overall effect on a game’s outcome. He hit 5 of 11 shots, 2 of 4 from deep, handed out six assists and turned the ball over four times. Whatever, right? But over a stretch in the fourth quarter, when the Blazers threatened to erase the Jazz’s lead, Rubio was stellar, making plays and shots that were key. The knock on Rubio often has centered on his shooting from the perimeter and his inconsistent finishing at the rim. Under the guidance of Quin Snyder, he has been encouraged to take open shots and utilize his craftiness with the ball not only to search for scoring opportunities for his teammates, but also to seek out his own. When it works, it’s a beautiful thing. When it doesn’t, it can scare the mud off a shovel. That’s because Rubio plays basketball on the court the way he would play futbol on the pitch back in the old country. He gets creative, attempting passes that either dazzle or distress — a bounce pass through traffic to Derrick Favors, a dipsy-doo lob to Gobert for a two-fisted dunk. When the Jazz acquired Rubio prior to last season, it was a move Snyder pushed for, in part on account of the fact that the coach thought the point guard could be utilized in ways he hadn’t been previously. And that has proved to be prophetic, demonstrated in the numbers and outside of them. He started slow a year ago, as did the Jazz. He started slow this season, as did the Jazz. He finished fast a year ago, as did the Jazz. He’ll finish fast this season, as will the Jazz. You can see it coming on in recent games. As the Jazz move through the rest of their schedule this season, here’s the related prediction: They will soar when their QB properly guides them. Mitchell and Gobert, in particular, will benefit, but everybody else, too. Watch for it and see. Just like we saw it last season. Remember that Game 3 in the playoffs against the Thunder, when the Jazz fell behind by 11 points and then Rubio led their charge back to a win, by way of a triple-double? He had 26 points, 11 rebounds and 10 assists in that game. It was then. And it could be the same way this time around, even in a jammed Western Conference playoff race, in which teams look like planes stacked up at La Guardia on a Friday afternoon. There still will be undulations in the Jazz’s ascent, nights when they look as though they could conquer the world, and nights when they stumble and bumble around, looking like the Washington Generals would beat them. But, on the whole, it’s easy to envision the Jazz rising, as the defense solidifies, the offense smoothes, the schedule turns more favorable and Rubio steadies the march. It happened before, it will happen again. In the Mess In the West, the Jazz may not end up at or near the top, but they will make their move, in large measure because of Mitchell, Gobert, and that other guy, the one not writing the love letters. The one speaking Spanish, the one saying: El Jazz ganara muchos juegos en los proximos dias.